Heart & Dagger Productions plunge into their 3rd Season with A DREAM PLAY by August Strindberg. 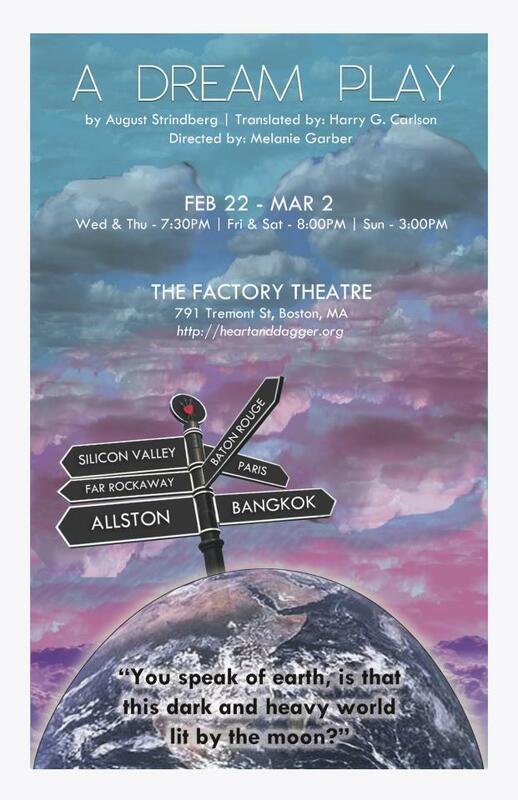 The production opens February 22, 2013 at The Factory Theatre, Boston, MA. Elizabeth Battey, Quentin James, Emily Kaye Lazzaro, Lauren Foster, Eric McGowan, Drew Linehan, Angel Veza, Michael Dix Thomas, Nicole Howard, Katie Drexel, Tony Dangerfield, Jenny Reagan, Erin Brehm, and Ryan Edlinger. The world premiere of A DREAM PLAY was at The Swedish Theatre in 1907, six years after it was written. August Stringberg was a Swedish playwright, novelist, painter, and poet. He is the playwright of The Father, Miss Julie, and The Ghost Sonata. During the 1890s he spent significant time abroad engaged in scientific experiments and studies of the occult. Strindberg died in 1912 at the age of 63. Heart & Dagger’s A DREAM PLAY is directed by Melanie Garber (Crave/Heart & Dagger, Priscilla Dreams the Answer/Fresh Ink, An American Plan/Happy Medium Theatre). Ms. Garber’s design team includes Cara Pacifico (Costumes & Props), Michael Clark Wonson (Lights), Steve Deptula (Sound) and Deirdre Benson (Stage Manager). This entry was posted in Listings and tagged 1907, 2013, A DREAM PLAY, Alice in Wonderland, Angel Veza, August Stringberg, Boston, Cara Pacifico, Deirdre Benson, Drew Linehan, Elizabeth Battey, Emily Kaye Lazzaro, Eric McGowan, Erin Brehm, February, Freud, Harry G. Carlson, Heart & Dagger, Jenny Reagan, Katie Drexel, Lauren Foster, March, Melanie Garber, Michael Clark Wonson, Michael Dix Thomas, Nicole Howard, Quentin James, Ryan Edlinger, Steve Deptula, The Factory Theatre, The Swedish Theatre, Tony Dangerfield, Vedic god Indra by Kitty Drexel. Bookmark the permalink.